We’re not sure this is the title we would give this dish, but alas, it’s not our creation and we’ll let Giada name it the way she wants to. We didn’t include prices on this recipe because they would not relate the frugal nature of dirty risotto. We like it because it’s the perfect use for that pepper you didn’t get around to using, and those onions that will go bad in a couple of days, and shoot- did we ever use those mushrooms? Throw those in too! While you can plan ahead and buy the ingredients to this dish, it’s a great way to empty your fridge and prevent food from going bad while enjoying it to the maximum extent possible. 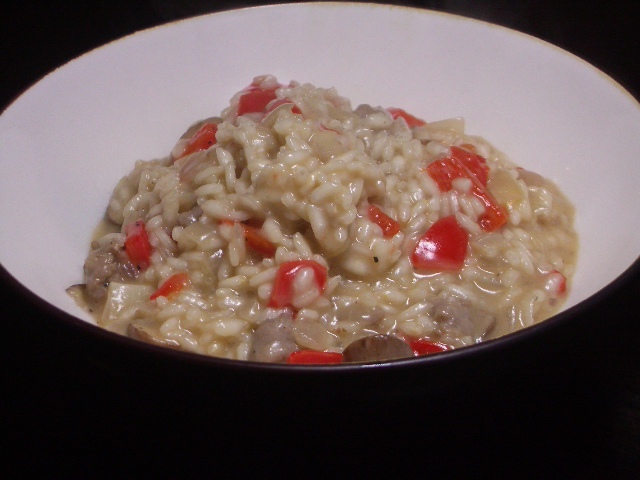 So, as a rule, we always keep a good supply of arborio rice around for just such an occasion!